Solid hardwood floors look great. They have a tough chunky look that spells quality and long life. And they will last long and look magnificent throughout if you take the effort to take care of them. 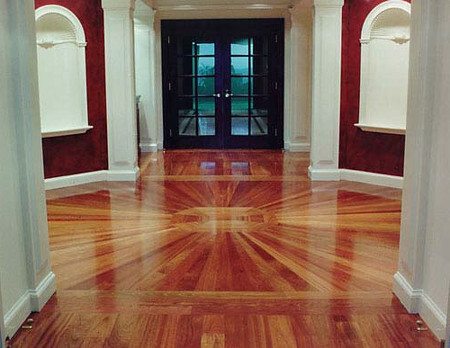 It’s not difficult, and the right kind of care will add years to your beautiful hardwood floor. 1. The worst enemies of your hardwood floor are grit, sand and dirt. These three act like sandpaper grinding, scraping and dulling the shiny surface until it becomes ugly. Use small mats near outside doors to prevent the dirt getting further into your house. 2. Water allowed to stand on any part of your hardwood floor can cause warping and discoloration. Be sure to wipe up any spills promptly. 3. Re-arranging the furniture is fine, but lift it rather than drag it. This will avoid scratches. 4. The sun can be strong and have much more power than you may think in mid summer. Direct sunlight can discolor a hardwood floor. Protect it with drapes, curtains or blinds. 5. Clean your hardwood floor by using a good broom, a canister vacuum with a special bare floor attachment or a good dust mop. 6. If your floor does get a bad scratch in it, get a scratch filler kit of the right color at your local hardware store. Sand and smooth the affected area first, and then mix the solution to get the exact right color. When it has dried, lightly smooth with a low grit sandpaper, then polish. 7. Pets are among your hardwood floor’s biggest enemies. They have claws and nails that scratch surfaces. Keep your pet’s nails well trimmed. Also, keep pet food containers off the floor surface. Pets always spill food around the containers, which will damage the floor over time. Use newspaper or something more durable to protect the floor.